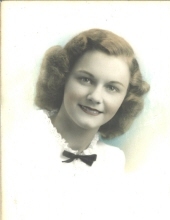 LAROBARDIERE, Frances Mary - age 92, of Linden, died Thursday, January 3, 2019. A memorial service will be held 1 PM Friday, January 11, 2019 at Sharp Funeral Homes, Linden Chapel, 209 E. Broad St., Linden with Pastor Dawn Russell officiating. The family will receive friends from 11 AM - 1 PM Friday at the funeral home. Those desiring may make memorial contributions to Loose Senior Citizens Center. She was born June 6, 1926 in Detroit, the daughter of Frank and Almyra "Babe" (Dutton) Gilbert. Frances married Charles Harrison Larobardiere on June 3, 1944. She retired from General Motors after 21 years of service. Frances was an avid golfer and charter member of Spring Meadows Country Club. Surviving are: husband of 74 years, Charles; son, Lane (Joyce) Larobardiere; two grandchildren, Amber (Tim) Bradshaw and Robert Larobardiere; three great-grandchildren, Gavin, Morgan and Linden. Frances was preceded in death by: her son, Larry; five siblings, Eleanor Twedell, Russell Gilbert, Mildred Leonard, Helen Braman, and Edward Gilbert. Tributes may be share at www.sharpfuneralhomes.com. To send flowers or a remembrance gift to the family of Frances Mary Larobardiere, please visit our Tribute Store. "Email Address" would like to share the life celebration of Frances Mary Larobardiere. Click on the "link" to go to share a favorite memory or leave a condolence message for the family.